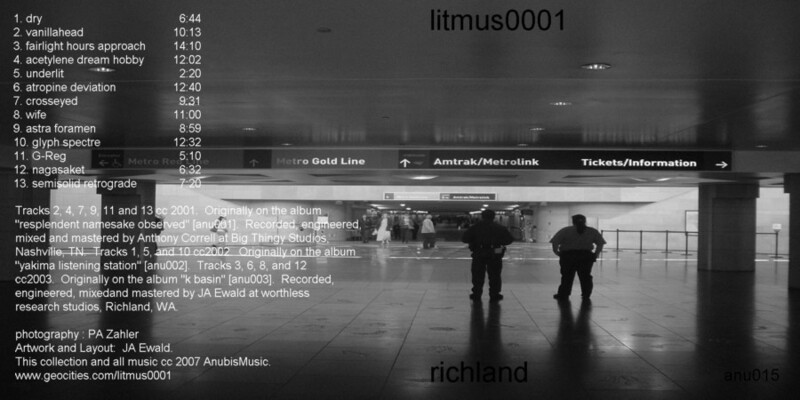 This album was a compilation of ambient tracks from the first 3 litmus0001 releases "resplendant namesake observed", "yakima listening station" and "k basin", which were all limited edition CDRs. These albums were my first exploration into this solo improvised ambient project after living and playing in Nashville for 8 years and moving to the high desert of WA state. I was learning about how to make the music, how to improvise, how to make sounds, and how to record it an make an album. 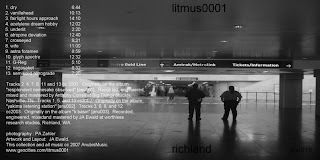 This album "Richland" represents the more successful ambient tracks from these releases, and allowed them to be more widely available to fans who heard the music on somaFM's Drone Zone, but to whom the music as an entity was not accessible. Again, this fine collection of experimental drone ambient improvisation is brought to the attention of the listening public.